This is what the Sovereign Lord says: “See, I will beckon to the nations, I will lift up my banner to the peoples; they will bring your sons in their arms and carry your daughters on their hips. I, Elisabeth, am married to Lars and a mother of five children. Our great passion is to serve Jesus in our lives. As a priest family, we have serve in several parishes over the last 21 years. My work in the Church has been in the diaconal field, for instance leading groups for people in mourning process. As a nurse I have worked in the somatic sector, in municipal health care and for a period with children and youths suffering from cancer. Since 1996 I had different employments in Østfold Hospital within psychiatric healthcare in Marker municipality, after further training as nurse of psychiatry. I also worked as a teacher in the area of healthcare, in educational programmers for adults in Oslo. Currently, I am employed at Østfold Hospital, psychiatric sector, emergency treatment ward. I, Lars, run a consulting company within organization development and learning. In 2003 I led and coordinated the test project of an international research farm in the area of ecological agriculture. From 01. August 2011 Blue Cross, a Christian organization, employed me as a teacher on their High School for pupils with special needs. Until 2004 I was a priest in the official Church of Norway, where after I started to work with changeover, outplacement and educating. The first time we saw Banners being used, was at the Swedish OAS-meeting in July 2003. 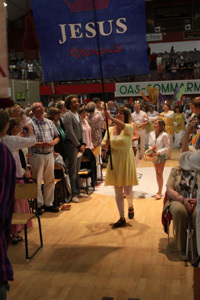 (OAS is a renewal movement within the Swedish church) Banners were used during worship and in processions. We felt that trough the use of Banners came a special presence of God. Right from start we realized that the use of Banners had its roots in the Bible. As Lars started to enter more deeply into the Hebrew Bible, he found that Banners had strategic, as well as prophetic significance to the people of Israel. The topic is even present in NT. In several passages in the Norwegian Bible translation, the meaning of “Banner” have been underrated and obscured. It is interesting to notice that in the original Hebrew text, the word “Banner” is used more frequently than the word “dance”. The rediscovering of Banners and the use of Banners in the Bible has been fascinating. In her encounter with Banners, Elisabeth experienced inner healing, and received a passion for Banners. She has made – and makes Banners for children and adults, for use in worship, adoration and manifestation. For a period she used to travel to Gothenburg in Sweden to participate in week-ends for worship dancers. Since then we have good contact with KDGS and with the Swedish OAS-movement. We have also been involved with, and served together with the OAS-dancing team in worship and in our own seminars. As to the Norwegian OASE-movement, we have been cooperating with the leadership. Since 2004, we have participated with our Banners in their conferences an even had stands. The worship teams of the evening sessions were always welcome to use our Banners. We have arranged seminars during OASE-conferences for adults and for children. At their special conference for kids and youths, we have served as a family team consisting of proximally 10 persons. We have arranged weekend seminars for families and we have even been teaching in churches and within Christian organizations. Elisabeth lends out and sells Banners on order. While ministering with Banners we sense the power of the Holy Spirit. The lord touches hearts and speaks directly to individuals. Some experience a power released while we use the Banners. We feel the guidance of the Holy Spirit as we use the Banners, during practice and training as well as in worship. We even sense a deeper drawing into the prophetic dimension of the ministry God has prepared for us. 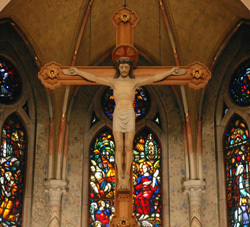 We confess one God: The Father, the Son and the Holy Spirit, who has revealed Himself, and the way of salvation, in the Bible. Our desire is to honor God through our Banners, and to represent Him. We wish to cooperate with the Church of Jesus Christ in all countries.